This is a weekly overview post of the Analysis category at @utopian-io. The report aims to provide insight into the topics covered, the scores provided, staff picks (if any), and a look at how the current week has fared against recent weeks gone by. Any other work taking place and my personal thoughts in relation to the category will also be included. If you have any suggestions for additional information that could be included in this report, please comment below. This particular report covers 2 weeks. Week 53 is split between the final days of December 2018 and first few days of January 2019. Weekly overview: 43, 44,45-46, 47, 48-49, 50-51. In summary, the contributions ( paulag's aside) scored averagely in the past two weeks. The single submission in week 52 was balanced by 7 the following week. The average comments on the contributions was slightly lower than the average in recent times, but it is likely that the time of year has had some effect on this. More than one analysis lacked a broad scope and failed to cover obvious additional metrics, meaning that an opportunity was missed to add value to the work. The reviewers tried to make the contributors aware of this, without sounding too harsh. Perhaps filters on the condenser used would give more insight into human/bot posters - if not a standard UI condenser, then likely scripted? Sadly the contribution lacks in many areas, including depth of analysis and visualizations, and I think more work on slicing and presenting the data could have been added. Unfortunately, the post does not fit the Utopian analysis category. The scope of this category is data analysis generated for Open Source projects, in the best case helping the project owner/maintainer in decision making for future developments. Market price analyses of assets on their own do not fall into the scope of Utopian. The standout piece was again related to Bid-bot earnings, and this contribution by 'paulag' also attracted around 45% of all the comments on Analysis contributions, over the past two weeks. The aim of this section is to represent the current weeks activity along with a recent set of data. The current data span covers the previous 14 weeks. An average score of 58.3 this week (53) is close to 15% lower than the 14 week average of 72.72. 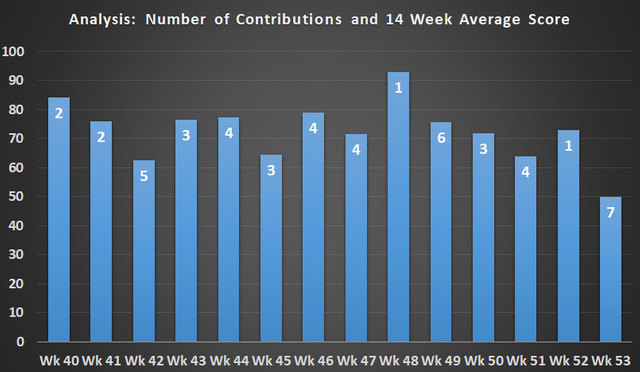 Six scored contributions is close to 60% more than the 14 week average. One new contributor since the last update. 'paulag' still tops contributor table with 14 contributions over the past 14 weeks. 'lostmine27' and 'miniature-tiger are tied in 2nd with 7 contributions each over this period. 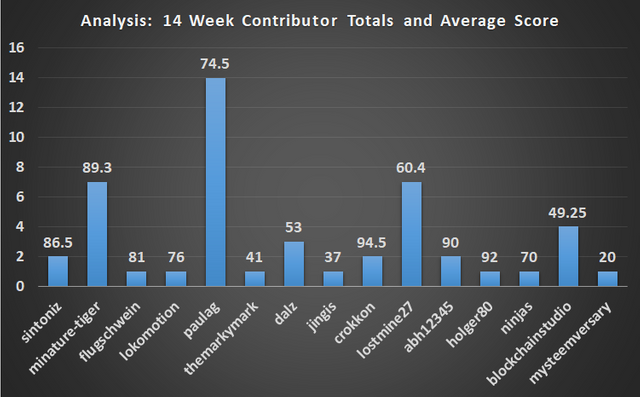 9 contributors have an average contribution score of 70 or above, over the past 14 weeks. Contributions that did not receive a score are not included in the charts above. 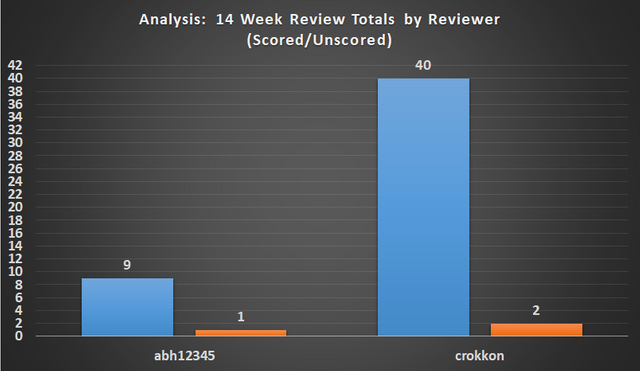 Two reviewers assessed all 49 contributions that received a score in the past 14 weeks. One contribution this week was reviewed by 'crokkon', bringing the total to 3, which is only 6% of all contributions submitted/reviewed. Thank you for contacting me personally @abh12345 ! I will be back soon. I was on hiatus due to some changes in my day job schedule. I was still on adjusting with my new schedule. Aside from that, I have a personal matters to attend to in the last few months. I love the utopian-io , steemit and steem blockchain in general. I am am happy to contribute sooner. Once again, thank you! This is a bit more positive for utopian-io, and I'm thankful for the reply. I still suspect the current market to be weighing heavily on the fall in contributions to the category. Although, this week 7 contributions is a good effort, and we already have a couple logged for next time. At present, I'm reasonably happy with the category, and think that as 2019 progresses, Analysis, and all the categories at utopian-io can grow further. 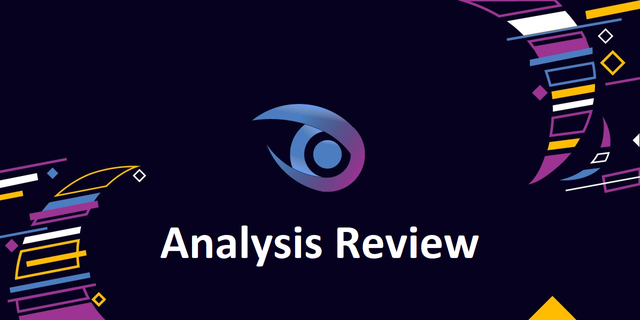 Thank you for providing the weekly overview for the Analysis category. The report is informative, and all visual data looks great. The week 52 was different from week 53. The category was really dull in week 52, but there was a drastic change in week 53. It's really great to see much contributions to a category like this in the holiday period. I am happy to see the response you got on your task of growing the category. I said it in my last review comment. ''There will be more positive responses''. Thank you. Your effort is well appreciated. Thanks very much and a Happy New Year to you too! A good week this past week, and I think it can continue from what i've seen so far. Cheers! Great to hear that you reached out to former contributors and got positive feedback! With the start of the month and the new year, I hope we'll additionally see some more monthly posts on December data and full-year recaps in the next week! I have started to see some more activity the last couple of days; perhaps many willl return after the Holidays to start the new year with more contributions. I saw in @penguinpablo’s latest post that there was a pick up in general as well. Time will well! Thanks for your efforts! I have also seen a little more activity in general, good to here PP's numbers are supporting this. Just read your post on the financial journey this year, $1 a STEEM is a reasonable B/E / target in my opinion. And as you state, it's not just buy and hold, you can do plenty with your Stake to help yourself and others.